2017 Notification. Candidate will be selected based on merit in objective type written exam for this JKSSB Junior Librarian and Library Assistant Jobs. For JKSSB Junior Librarian jobs candidates must have qualified Degree in Library Science and for Library Assistant Jobs Degree qualification in 10+2+3 or 10+5 pattern is mandatory. Online applications will be acted for this JKSSB Recruitment of Jr Librarian and Library Asst jobs through www.ssbjk.in website. Last date for submission of application form online for this JKSSB Recruitment is 11-11-2017. More details about these vacancies of Jammu Kashmir School Education department educational qualifications, selection process and other details are given below. 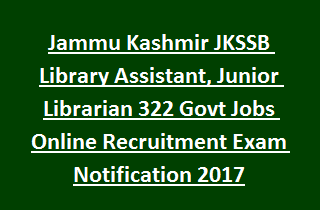 There is total 322 Library Assistant, Junior Librarian jobs in this Jammu Kashmir Education Department recruitment 2017. As on 01-01-2017 candidates upper age limit is 40 years. 43 Years for SC/ST/RBA/ALC/OSC candidates, 42 years for PWD candidates and 48 years for Ex serviceman. For Library Asst Candidate must have qualified degree. For Jr Librarian Jobs Degree in Library Science is required. As per the Jammu & Kashmir State norms. Application fee is Rs.350/- candidate have to pay this amount through online or using challana or through CSC centers. Candidates will be selected based on written exam marks merit only. No interview for these JKSSB vacancies. Written test will be objective type only. There is a negative mark for each wrong answer. Interested and eligible criteria having candidates may submit their application form online on or before 11-11-2017 through JKSSB official website of www.ssbjk.in.